From February 9th to the 13th 2015, 21 fine art students, curators-to-be, and recent graduates participated in the AtWork workshop, equipped with two small moleskine notebooks. 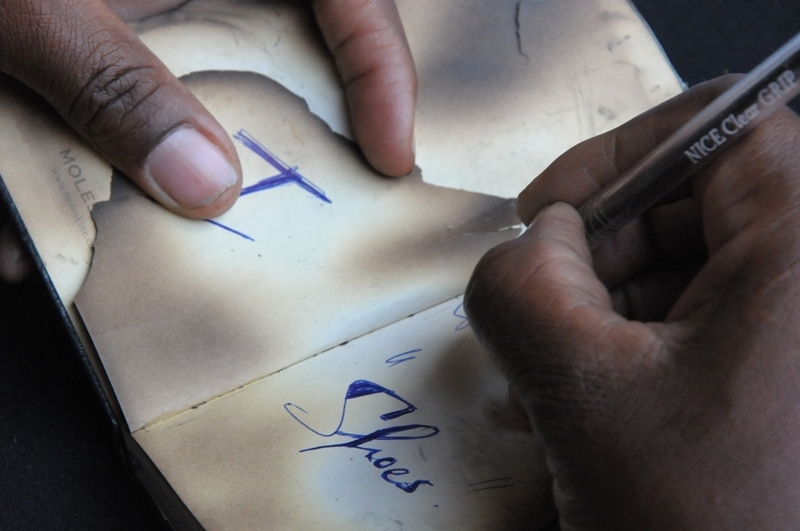 One book was reserved for ideas, question, and notes and the second for executing their interpretation to the question, “should I take off my shoes?” They worked under the direction of Simon Njami, with the support of Dr. Lillian Nabulime and Dr. George Kyeyune from the Margaret Trowell School of Industrial and Fine Arts. Participants and facilitators listens to Dr George Kyeyune. Simon Njami is fourth seated from left to right. The AtWork format was conceived by Simon Njami, independent curator and writer, and Lettera27, a nonprofit organization. The first format took place in 2012 in Dakar, Senegal, followed by Abidjan, Ivory Coast in 2013, and the third in Kampala,Uganda, totaling over 60 participants. The format was independently adapted in three other cities: Adliya, Bahrain; Watou, Belgium; and Cochabamba in Bolivia. 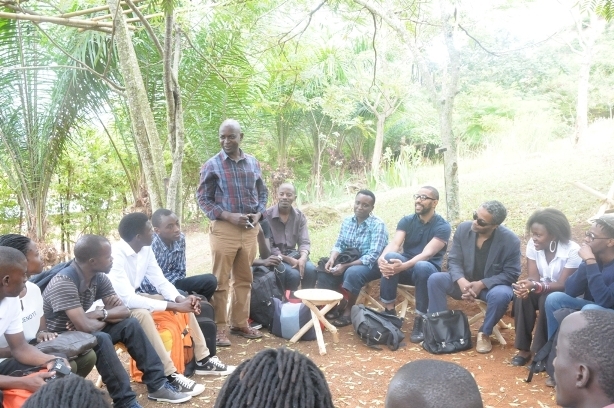 What brought a workshop from prominent cities on the contemporary art map to Kampala? It was down to the people. In 2012, Njami was curating an itinerant exhibition called Art at work and when it came to Kampala, it was curated by Katrin Peters-Klaphake. Because of her and the Makerere Art Gallery/ Institute of Heritage Conservation and Restoration Njami chose Kampala as the third location for AtWork. The workshop is over but don’t wait for a review. The spirit of the workshop is one that would encourage you to decide for yourself, but still, there can be no definite assessment of success for a workshop that remains in-progress. The organizers only pointed out an improvement from previous workshops. Adama Sanneh and Elena Korzhenevich of Lettera 27 said this particular AtWork workshop was the most successful so far because it had the right combination of organizers, venues, participants, and an intangible element that allowed cohesiveness. But of course, this could not be achieved in the first attempt because each workshop would inform the next. Day one and two of the workshop were set in the hills of Buziga at the Maisha Gardens. What was meant to be a serene setting was interrupted by tension as participants tiptoed around Njami’s questions, searching out landmines. From the moment participants began to introduce themselves as photographers, sculpture fabricators, or communication artists, they were placed under scrutiny and asked, is that really what you are doing? Are you an artist or a hired hand? What does a communication artist do? And anyway, doesn’t all art communicate? Participants took this criticism rather personally and it took all five days for them to come to terms with the questions posed and to even regard Njami as less of a cynical critic and more of a guide. Day two and three broke the group down to smaller discussions that dug deeper into questions and gave artists the space and safety of fellow participants to admit they actually did not know what they were doing. Thursday, day four, was a difficult transition from concept to concrete work. Participants had to pull back from self-examination and focus on executing their concept in a day and a half. Perhaps it was the relief of completing the workshop but the open discussion on Friday evening was full of positive reviews and sentimental confessions. The results are still in progress. As Njami said to the participants at the end of the workshop, “I’ve been telling you that you are lazy and I think that you are less lazy than you were when we started.” In other words, the participants are still in progress, as is the workshop since the notebooks have not been exhibited and the process of self-examination does not end. The years to come will reveal what participants gained from this workshop. If, in five years, the contemporary artists of Kampala continue to examine their identity, work and purpose, we can assume maturity. If so-called curators remember that their work cannot exist without artists, we can assume awareness. If the participants continue to share their work and revelations with others and never settle into pre-defined terms but rather shed easy labels and resign themselves to constant examination, we can assume progress. Gloria Kiconco is a journalist and editor particularly interested in writing about arts and culture in Uganda. She relates these stories to Ugandans as well as the international arts scene. 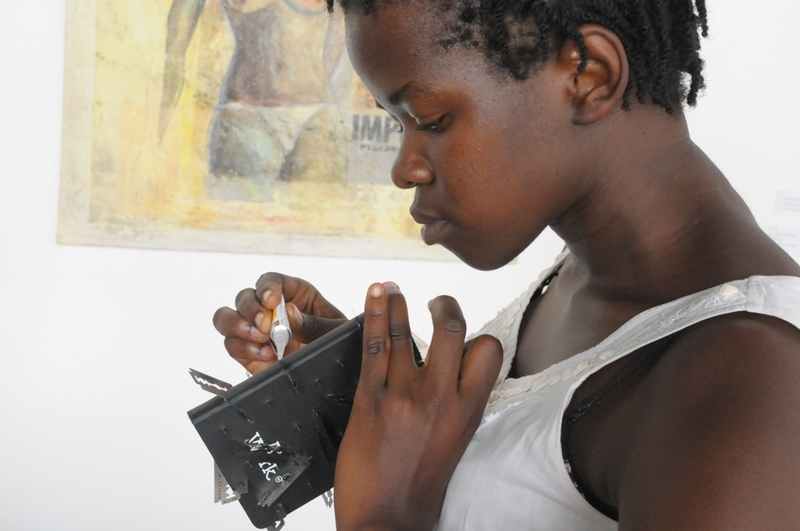 She also writes poetry and often recites at Poetry –in-Session and Kwivuga. I am attending a workshop in india. and the experience i had during the artwork workshop is only manifesting itself even more. breaking the rules is my guiding theme and I am sure this is influenced by the AtWork experience. …experimenting with out worrying what the audience thinks. making art for ones self. thanks Lettera thanks Simon Njami.. Its only the beginning for me.